Starbucks at Istanbul’s Bogazici University campus had been occupied by students, the protesters stayed in the store overnight. Istanbul / NationalTurk – Starbucks at Istanbul Bogazici University Campus was occupied by students last night in Istanbul, the protesters blocked all entries to the newly opened Starbucks store at the campus and protested in a peacefully manner where they have stayed overnight, ate food they brought with and sang. The students of Bogazici University, one of the globally renown and quality universities in Turkey, occupied a newly opened Starbucks store at the Bogazici University Northern campus in Istanbul protesting the University administration for opening the university campus area to international brands and thus making it a market rather than using it for educational purposes. They stayed in the store overnight, used the kitchen of Starbucks to cook meals and sang. Academicians have are reported to have showed support to the students. There are currently 66 Starbucks stores in Istanbul. 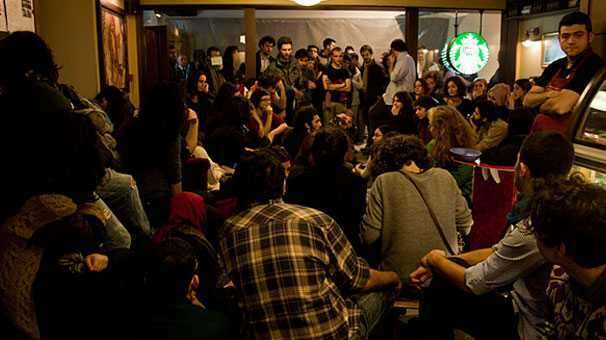 via Occupy Starbucks Movement at Istanbul Bogazici University.